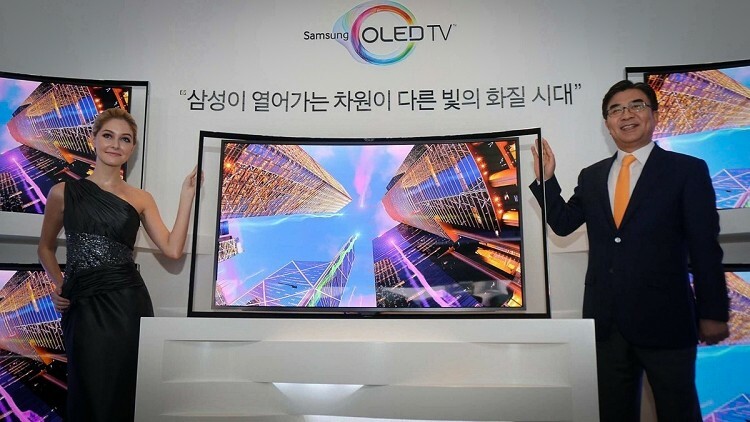 Samsung will begin shipping their 55-inch curved OLED with Multi-View technology starting tomorrow for $8,999.99. That may seem like a hefty chunk of change to drop on a television (and it is) but it’s far better than the $15,000 price tag associated with the set just a couple of weeks ago. During a press event in New York City earlier today, the company said better than expected yields allowed them to price the set under the $9,000 mark. At this price, Samsung executive vice president Joe Stinziano said it will appeal to customers who value picture quality while early adopters with sizable bank accounts will likely opt for 4K sets. OLED televisions offer exceptional image quality with contrast that must be seen to be believed. Specifically, the blacks are nearly spot on as each pixel emits its own light and colors are vibrant and saturated as there isn’t a need for color filters. A curved display is said to offer an improved viewing experience, at least in theory, as the viewer will be more immersed in the action. When sitting right in the center of the viewing area, pixels on the far left and right are said to be at the same distance to your eyes as those located in the middle of the screen. But perhaps the most interesting aspect of Samsung’s new set is Multi-View, a technology that allows two different users to view two different programs at the same time using special active 3D glasses. Each set of glasses comes equipped with their own headphones to allow each viewer to tune in to their individual program.